As I've previously noted, I have been spending the past couple of months testing Tk-Cocoa as a foundation for my programs. This has involved repackaging one of my previous applications to run on Tk-Cocoa as a way of putting Tk-Cocoa through its paces, filing bug reports and submitting patches to enhance Tk-Cocoa, and documenting my progress. I've also developed some cool Cocoa-based extensions to add specific features to my programs; one of these extensions, TkDock, has been released as open-source and has already been adopted by a couple of programs. In the meantime, I have done no new work on my currently-released programs, which still run on the older Carbon implementation of Tk. Does this make business sense? Nearly all of the work I've been doing has been an unpaid, volunteer effort. No one pays me to write patches or submit bug reports on Tk, and I don't earn any royalties when someone uses one of my Tk extensions in their work. The past couple of months have been very productive from a coding standpoint, but have not resulted in any updates or new releases of a commercial product. I think the time I've been spending does make sense from a business standpoint. Everything I've been working on is directly related to the development foundations of my programs, Tcl/Tk and Python. Some of the bugs I ran into were literally showstoppers: they caused Tcl/Tk to crash. It's hardly feasible to release a commercial program that crashes frequently. Also, in terms of patches and enhanced functionality as opposed to bug reports, the code I've been working on addresses a few long-standing gripes about how Tcl/Tk looks and/or works on the Mac. These patches really, really improve a few things and put Tcl/Tk on par with other cross-platform frameworks. So, in other words, I'm getting a lot of bang for my buck in terms of the time I've spent. I'll be able to fold these improvements into my applications immediately. And, hopefully, that will improve their sales. The other aspect of contributing to open-source projects is one I've discussed before: it's about giving back. I've benefitted from the labor of an entire community of developers, many of whom are unpaid. (Though, to its credit, Apple apparently sponsored Daniel Steffen's work on porting Tk to run on top of Cocoa.) I am glad to share the improvements I make to Tk with the larger community. In another sense, as well, the time I'm spending is little different than time spent by dozens of other Mac developers who have to move their code from Carbon to Cocoa. Since 2007, Apple has made it forcefully clear that Carbon is dead, and Cocoa is the future. Tcl/Tk is hardly alone in this respect, and it is not late to the game either. The time I'm spending transitioning my applications to Tk-Cocoa, and the time I spend contributing improvements to Tk-Cocoa, will be abundantly repaid later on--repaid in the continued viability of my products, in their improved capabilities, and continued and increasing sales. My previous post focused on the user-visible changes in Tk-Cocoa, and how these will improve Tk applications on OS X from a user perspective. This post will focus on some of the technical changes of Tk-Cocoa, so that developers who have previously deployed Tk applications on OS X can smoothly transition their applications to the new framework. Despite assertions to the contrary, there are some "script-level" changes in Tk-Cocoa--that is, changes that will require adjustments to actual Tcl/Tk code to adapt to Tk's new Cocoa implementation. When Tk sees a .menubar.apple menu as the first menu in a menubar on the Macintosh, that menu's contents make up the first items of the Application menu whenever the window containing the menubar is in front. After all of the Tk-defined items, the menu will have a separator, followed by all standard Application menu items. Such a .apple menu must be present in a menu when that menu is first configured as a toplevel's menubar, otherwise a default application menu (hidden from Tk) will be inserted into the menubar at that time and subsequent addition of a .apple menu will no longer result in it becoming the Application menu. Otherwise Tk's hard-coded application menu will blow away your custom application menu, and move it elsewhere in the menu display. This works differently than the Tk Apple menu in Tk-Carbon. When Tk sees a .menubar.window menu on the Macintosh, the menu's contents are inserted into the standard Window menu of the user's menubar whenever the window's menubar is in front. The first items in the menu are provided by Mac OS X, and the names of the current toplevels are automatically appended after all the Tk-defined items and a separator. When Tk sees a .menubar.help menu on the Macintosh, the menu's contents are appended to the standard Help menu of the user's menubar whenever the window's menubar is in front. The first items in the menu are provided by Mac OS X. This command tripped me up at first, since I strongly dislike Apple's built-in system for viewing user help and thus don't use it, and I thought other developers might find it confusing as well. If you define your own help command in your Tcl/Tk code and place it in the "help" menu, then your application will display two separate help commands--the standard Cocoa help command, and the one you've defined. This would be very confusing to end users. After providing Daniel Steffen some feedback about this, he implemented the tk::mac::ShowHelp command to override the standard Cocoa help menu item (you can also still include additional items). puts "creating iconbitmap for $item..."
Native Mac icons, rendered by Tk. This command was causing a hard-to-isolate crash in Tk; thanks to Daniel Steffen for tracking it down and fixing it. Now that the command is stable, it's the jewel of Tk-Cocoa, in my view. My last post also said that it wasn't possible to render a "unified toolbar" in Tk-Cocoa. That isn't entirely accurate. Through a combination of Mac-specific configuration items (specifically, setting the window's style to "metal," and drawing many widgets with the "systemTransparent" background), it is possible to closely emulate the unified toolbar, as the screenshot below shows. However, the resulting application window has serious usability issues. The window "flashes" when it's resized, and it can also be dragged around from any point on the window, instead of just from the titlebar, which is standard Mac behavior. (Apparently exposing the underlying "metal" background of the window via the "systemTransparent" background causes some of these issues.) The fact that the window can be dragged from any point makes it hard to select and delete text from the entry field, for instance. It gives the entire window a jerky, unpleasant feel. In this case, I'm going to forego the native Mac appearance for something that looks a bit less native (see the other application screenshot in my previous past) but is more usable. There are some other things still missing from Tk-Cocoa as well: native drag-and-drop integration and native, non-command-line printing are two of the biggest gaps. However, these capabilities are not part of Tk's core on other platforms, either, such as Windows. Extensions for such capabilities exist, but they either have not been ported to the Mac or depend so heavily on Tk's platform-specific implementation (i.e. Carbon) that they need to be rewritten for Cocoa. No matter. All in all, Tk-Cocoa is a big step forward for Tk developers on the Mac, and I hope these notes provide some assistance in getting other Tk applications to work with it. 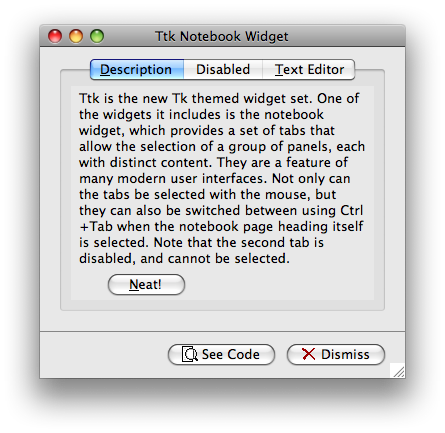 The updated Tk-Cocoa notebook display. The updated Tk-Cocoa column display, with "Aqua-blue" column header and sorting arrow. You'll notice some immediate differences. 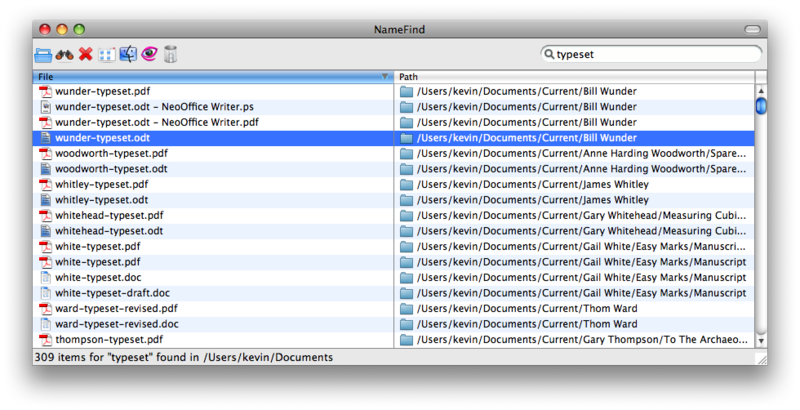 The Tk-Cocoa version uses native Mac icons, retrieved on the fly from the system like other Mac applications, such as Finder. The Tk-Carbon version uses generic images, because it could not render Mac icons correctly. 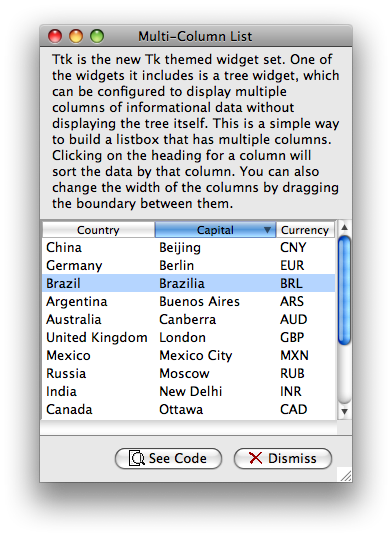 The Tk-Cocoa version also correctly implements the sorting layout of a Mac table view, with the column header rendering its selected status natively ("Aqua-blue"). The Tk-Carbon version didn't support this. From a user standpoint, the advantages of the Tk-Cocoa version are pretty clear-cut. It offers superior visual integration with OS X, making it easier for users to be productive. No need to take a close look at the file, for instance, to figure out what kind it is; the native icon provides a visual cue. Similarly, the "blue" column header makes it immediately obvious which column is being sorted. 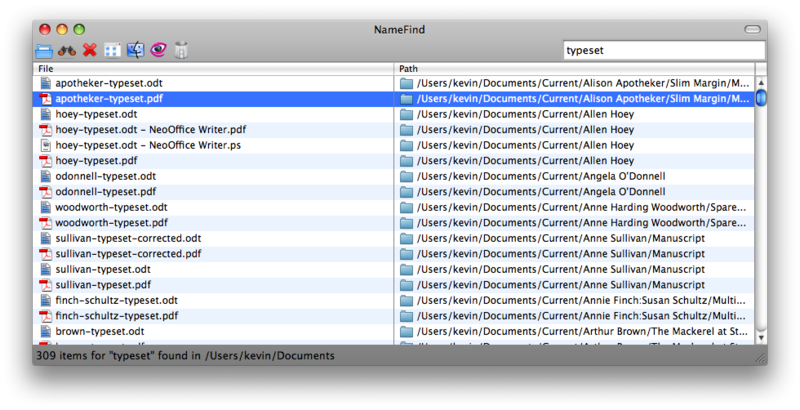 Under the hood, there's another advantage: I've compiled NameFind as a 64-bit application, which is the direction all Macs are going. 64-bit allows increased memory usage, and can improve performance. All in all, however, I'm very pleased with the improvements that Tk-Cocoa is allowing my software. My software will benefit from an improved UI appearance, improved 64-bit performance, and continued viability on OS X.